When I first saw this oxford I didn't realize what it spelled out. I simply liked the random letter placement and bold typeface. After getting it into a handful of clients closets, I decided I wanted it too. I rarely purchase items I've helped clients source, but I knew this top was selling out quickly and managed to pick it up on sale to lessen the sticker shock. It falls in line with my style resolution this year as a FUN piece and has added a little subtle whimsy to my wardrobe. 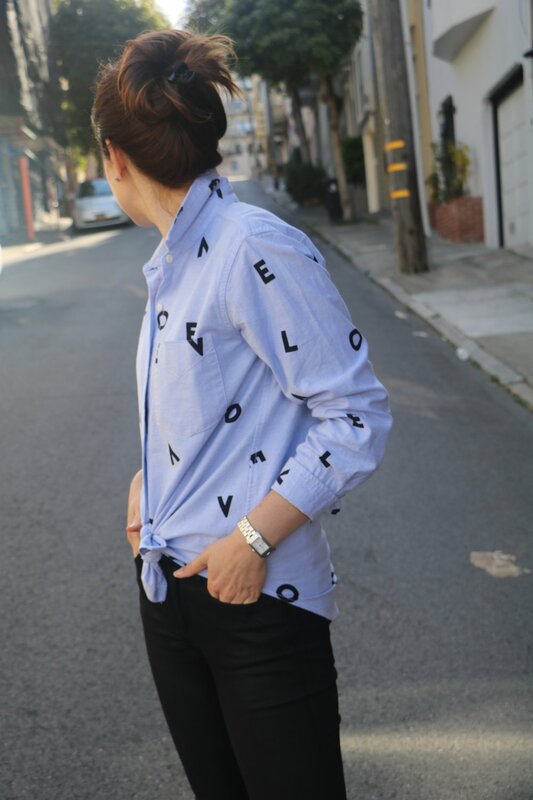 The boyfriend shirt is an effortlessly chic staple to have in your closet this season. A classic oversized white oxford has been made popular by many a Hollywood glamour gal. We love the clean lines, structure, and volume that add a pinch of undone sexiness to a stolen menswear look. This Current/Elliot shirt is made of a thick cotton so it's a perfect weight for a crisp look that is comfortable during our San Francisco spring. When wearing an oversized boyfriend fit I recommend adding a little tension to the look with skinny jeans. A slimmer silhouette on the bottom will keep the shirt from overpowering or shortening your frame. The stark black typeface really pops with black jeans. I wanted to add a little more edge in the look for daytime meetings, so I chose my waxed denim. Although the ensemble is powerful alone adding another print helps balance the graphic shirt. Since I'm on my feet most days, my leopard print flats keep the look crisp and playful. What's old is new again in the world of fashion. With higher pant rises we have been seeing more reasons to tuck in your shirt again and regain your natural waist (guys this goes for you too). To further balance the volume of a boyfriend shirt, we recommend popping the collar to add vertical distance, half tucking the front with the back tails out, or tying it in the front. Try it for yourself, you might just find your love match in one of the comfy styles below. Posted on April 26, 2018 by Kimberly Gant and filed under Style Stories and tagged boyfriend shirt current?elliot oversized shirt joes French Sole.